I love money saving, or just helpful ideas. 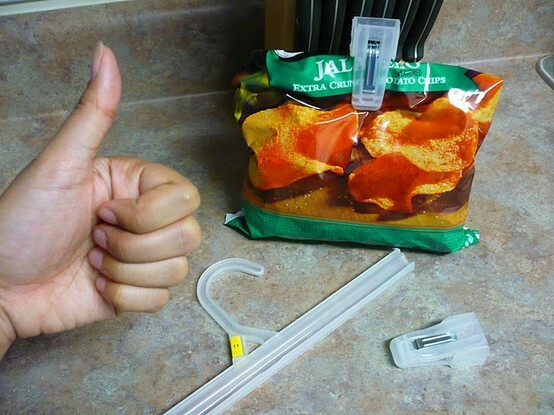 This is a great one from Craftster, repurpose a plastic pant hangar into chip bag clips. Flavoring such as caramel topping, chocolate for a mocha etc. Heat 1 cup of boiling water, I heat it in the microwave for 2 minutes. Measure out the desired amount of coffee, I use 1 lg scoop for a lg coffee. Place in french press. When my water is fully heated I dump it in the french press and place the top on for 2-3 minutes, the longer you let it ‘steep’ the darker and smokier the flavor will be. So adjust to your liking (I like a light flavor). While I am waiting for my water to heat up I whip a little whipping cream to top my coffee. If I really want it thick I put it in my mixer and mix it for 2 minutes on high. If like today, I just wanted a quick and easy coffee I whip with a whisk while I wait for my water to heat up. Add sugar to your whipping cream to sweeten it, and sweetens your coffee. For my lg coffee I use 1 cup milk to mix with my 1 cup coffee to make the latte. Not exactly the true latte mixture but it gives me a similar taste to dunkin donuts latte. So I heat the 1 cup milk in the microwave for 1 minute. You can whip this to make it frothy if you would like (I don’t notice enough of a difference so I skip that step). Add whatever flavor you like best, I like using a caramel ice cream syrup for a yummy caramel latte. By the way the amounts for making my coffee are for a medium travel sized cup, or about 1.5-2 small mugs like pictured. Taking a picture of my travel mug with a top just wouldn’t look as yummy as this. I am taking full advantage of my subscription to Mealsbytheweek.com. This week I am using most of the recipes found through their service. Meals by the week combines meal planning with what is on sale at your grocery store helping you save even more money. Making a meal plan is very simple but so many people don’t do it. It is a great way to organize your home and save money. Yay! I love saving money! For me grocery shopping used to be Friday night after work stop at the grocery store grab a little bit of everything to keep the cupboards full. Then I would go home uninspired, stressed out, and about 8pm at night very exhausted. Throughout the week I would throw together the same meals week after week and dread making dinner. I would also feel like we had no groceries by the time the week was over even though I really did have a lot still in the cupboard, just not any of our average meals I was accustomed to making. Now I have my meals planned out, if I defer from the plan I know I have an extra meal that can be made so I don’t have to get more groceries even longer. We eat out less (from 1-2 days a week to none unless we are traveling out of town). And I don’t grocery shop late on a Friday anymore (stress central), and when I do shop I have a plan, buy less, and enjoy cooking again. I am actually learning a lot of new recipes, and techniques in the kitchen to boot! Step 1. Create a list of family favorite meals, meals you want to make but never have, and look through cookbooks for more inspiring ideas. Try to make a list of 30-50 meals if you can. If you are still having trouble thinking of ideas look through grocery circulars for what is on sale, and look in your cupboards for the inspiration for dishes you might already have some ingredients for. Step 2. Make a shopping list. I like to write out some of my favorite meal recipes on recipe cards that way when I pick what I want to make for dinner I have the recipes right there so I don’t forget to write anything down on my shopping list. Step 3. Organize your shopping list with the amounts of the different items you need. Example. I need 2 lbs of potatoes for mashed potatoes, and 1 lb for potato salad. I also need 4 eggs for a quiche and 8 eggs for morning breakfast for the week, and 4 for french toast on the weekend, and 4 cups of cheese for macaroni. Bonus: Since you have your ingredients measured out for the week and you have your shopping done. You can now save even more time for dinner by prepping for the week. Instead of dicing 1/2 an onion three different days at dinner time, you can dice it all at one time, store it in the fridge in pre-measured proportions and by doing so you can save yourself time. By doing your weeks prep ahead of time you will save yourself time and stress. I challenge you to try meal planning for a month and see what you think! There is a yp (yellow pages) deal for 50% off Meals of the Week mealplans. This service makes meal plans for you and your family and it gives shopping lists for those meals as well. The service says the meal plans are based on what is on sale that week. So save money and time by having meals planned out for the week and a shopping list prepared for you. Then an extra bonus – save extra money because these meals are planned out according to sales. To purchase this deal on yp (11 days left) it is $7.50 for 13 weeks. I had a $5 credit for signing up with yp which made this only $2.50 for me. Yay! I’d pay $2.50 just for more healthy recipes or a cookbook any day! I so far like the service, the website is easy to navigate and it is very nice because you can choose for how many people the recipe will be made for and the recipe and if you are having fguest there is a double option. Also if there is a meal you just know your family won’t eat you can skip it so your shopping list won’t include it. We will be traveling this week so my menu plan is not meals, but road snacks. Here are the roadsnack meals I came up with. To drink; juice packs and 1 gal of water (maybe 2) we can refill our waterbottles with. Obviously we are traveling with kids and I just don’t want to fall into the junk food pit and feel lousy and I don’t want to pay gas station prices for snacks. Wrap leftover blocks of cheese in aluminum foil. The taste is much fresher than wrapping in saran wrap. Everyday there is something each of us do to save money. Today I made my own pizza crust for the first time. Usually I buy crust from walmart for $0.88 but why not make my own? It turned out good minus the fact that I ran out of flour at the end. Let raise for 30 minutes, knead and raise again for 20 minutes then start throwing it in the air and make some pizza! For the first time I made a garlic pizza. 1/8 C butter melted with 4 large cloves of garlic (my family loves garlic), spread it on the crust, added cheese and baked for 20 minutes. Yum yum it was great, next time I might try with garlic and oil instead of butter. Last night I spent some extra time in the kitchen making some freezer meals. I had 5.5 lbs of ground beef that I had gotten a good deal on and I didn’t want any of it to go to waste. I turned that 5.5lbs into 5 meals. I ground the beef for the tacos and sloppy joes in two separate large pans, added the other ingredients, let cool, bagged into two bags per meal and froze. Before I freeze any meat I try to make sure the date it was made and what it is has been written on the bag. I also write any notes that I think I might need to help me remember or to guide my husband incase he needs to cook it. The mini meat loaves – I mixed the meat loaf together and froze in mini sized loaves and that will have to be cooked in the oven when the time is right. All of these are easy meals are basic and very easy. And since my husband always takes leftovers to work with him for lunch those 5 dinners are worth 10 meals.